To better understand the tangible differences of the new Digital Tax process, BigChange has taken a deep dive into the UK’s aim to Make Tax Digital. Who is obligated to file digital tax returns? What is the timeframe of this implementation? How can the digitalisation of tax records and invoicing (via BigChange) save your business time and money? What industries or sectors will be impacted the most by the digitisation of the tax filing process? How can the BigChange platform help my company integrate our existing invoicing and billing to comply with the Digital Tax record requirements? How does Sage integration with the BigChange Platform to help your business run more effectively? 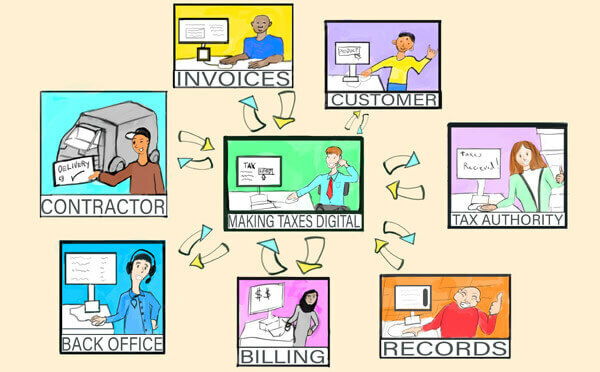 What records need to be submitted and maintained through the Making Tax Digital Process? What is a Digital VAT Account, and what is required to update your information? Q: Who is obligated to file digital tax returns? What is the timeframe of this implementation? A: Most businesses with a turnover above the VAT threshold [currently £85,000] will be affected from April 2019, if they pay VAT. Niche and more complex businesses or organisations [around 3.5% of the total] have a postponed Making Tax Digital “MTD” start date of October 2019. Making Tax Digital for VAT has the force of law and is therefore mandatory. Outside of a handful of very unusual circumstances, you can’t opt out of MTD for VAT. In the UK, 89% of companies will have to alter the way they submit VAT. Q: How can the digitalisation of tax records and invoicing (via JobWatch) save your business time and money? A: On average a small-or-medium-size business can save 27.6 days a year by using digital accounting software in comparison to using manual methods, therefore giving you precious time back to focus on growing your business. An SME that uses digital accounting software can make an estimated saving of £17,000 per annum. Digital accounting software seeks to further decrease your admin time, leaving you with more money to reinvest in your business. By automating submission, MTD will help businesses manage their tax affairs by alerting them before payment is due and keeping them on top of their tax liability. This will prevent payments from piling up and reduces the chance of error and incurring penalties. Q: What industries or sectors will be impacted the most by the digitisation of the tax filing process? A: The agricultural industry, Non-resident landlords, Medical practitioners and consultants operating clinics at several sites, Construction workers, Universal credit (UC). Q: How can the BigChange platform help my company integrate our existing invoicing and billing to comply with the Digital Tax record requirements? A: With ‘Making Tax Digital’ you’ll never have to enter the same information twice. You’ll have a real-time view of your tax, so you won’t be taken by surprise. As a Sage Platinum partner, we’re here to help all our customers towards being MTD ready. To make the process of reporting your tax digitally even easier, BigChange has created the JobWatch Sage 50 integration tool. It links the two systems together seamlessly, so data can be exchanged automatically. Click HERE to learn more about the new Sage 50 integration tool. Q: How does Sage integration with the BigChange Platform to help your business run more effectively? Key financial data and transactions that occur in BigChange are automatically synced with Sage, including information on VAT collected or paid. This includes Sales Quotations, Purchase Orders, Sales Invoices and Receipts, as well as Credit Notes, Nominal Ledger codes and Department codes. BigChange’s integration tool has been written for Sage 50c Professional and is currently compatible with Sage 50 v24 and v25. Q: What records need to be submitted and maintained through the Making Tax Digital Process? A: Under MTD for VAT, businesses will be required to keep digital records and to file their VAT returns using functional compatible software. The four main categories of records to be kept digitally include; Designatory data, Supplies made, Supplies received & Digital VAT accounts. Q: Could you explain in greater detail what is included in the Designatory data, Supplies made & Supplies received that must be kept digitally? A: For Designatory data you will be required to have digital records including; Business name., the address of the principal place of business, VAT registration number, and a record of any VAT schemes used (such as the flat rate scheme). A: For Supplies made you will be required to have digital records included for each supply made: Date of supply, Value of the supply & Rate of VAT charged. Outputs value for the VAT period split between standard rate, reduced rate, zero rate and outside the scope supplies must also be recorded. Multiple supplies made at the same time do not need to be recorded separately – it is sufficient to record the total value of supplies on each invoice or receipt that has the same time of supply and rate of VAT charged. A: For Supplies received you will be required to have digital records included for each supply received: The date of supply, The value of the supply, including any VAT that cannot be reclaimed, The amount of input VAT to be reclaimed. If there is more than one supply on the invoice, it is sufficient just to record the invoice totals. Q: What is a Digital VAT Account, and what is required to update your information? A: The Digital VAT account links the business records and the VAT return. The VAT account must be maintained digitally, and the following information should be recorded digitally: The output tax owed on sales, The output tax owed on acquisitions from other EU member states, The tax that must be paid on behalf of suppliers under the reverse charge procedures, Any VAT that must be paid following a correction or an adjustment for an error, Any other adjustments required under the VAT rules. In addition, to show the link between the input tax recorded in the business’ records and that reclaimed on the VAT return, the following must be recorded digitally: The input tax which can be reclaimed from business purchases, The input tax allowable on acquisitions from other EU member states, Any VAT that can be reclaimed following a correction or an adjustment for an error, Any other necessary adjustments.